Hello everyone and welcome to Connecticut, the first stop on our Road Trip USA journey across the U.S.! We were so excited to start this trip after the fun time we had last year with our Expedition Earth World Geography! Of course I had to take some of the fun stuff from our Expedition Earth studies that went over so well. 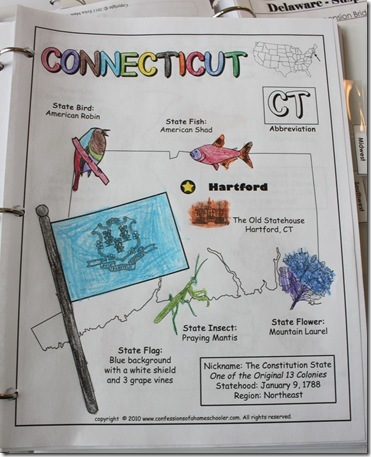 So we started off with a brand new Travel Log ready for lots of state stickers to be added! uhem…50 to be exact. 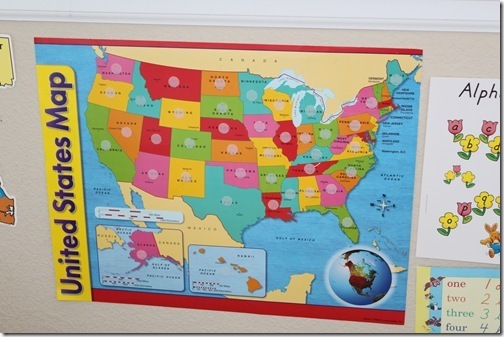 Next we found our state and capital on our U.S. Wall Map. 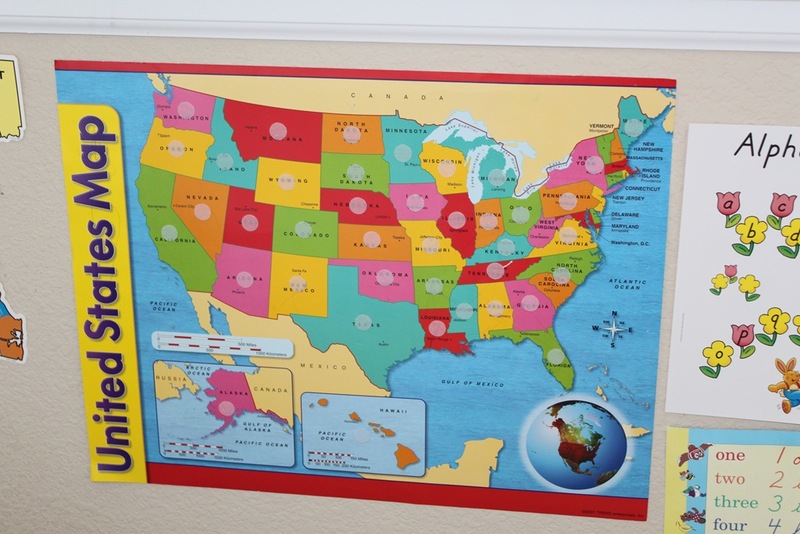 Last week in our Intro to US Geography week, we learned where the different regions are that we’ll be going through, so each state we talk about I review the region it is located in. Learned about the State Insect: The Praying Mantis and did a paper craft. Had hamburgers in respect for CT which is known for the first hamburger! 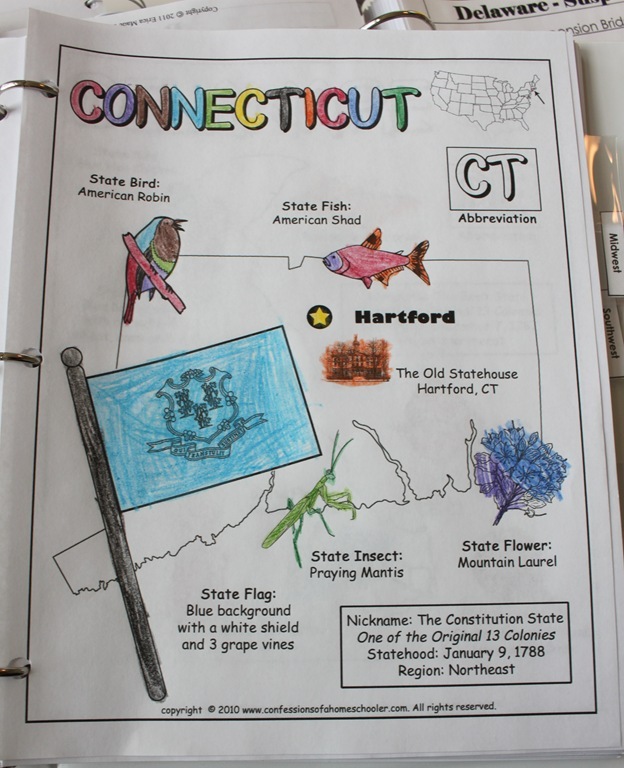 Next the kids colored their state worksheets as I read the facts for that day. 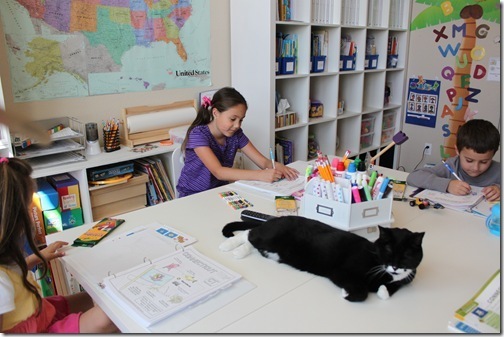 The cat likes to be involved, so he makes himself right at home on our new Ikea clad school setup. 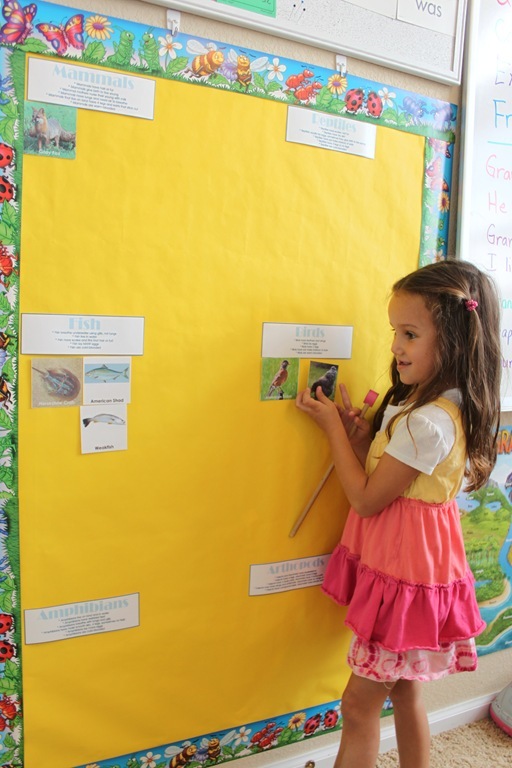 On the first day, my kids immediately started asking where our animal wall was…if you didn’t follow our Expedition Earth trip last year, you can check out our World Animal Wall here. Anyway, I sat down and made up an animal set for our Road Trip USA study! 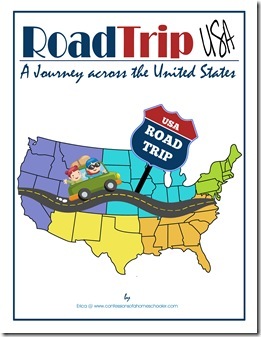 You can download it free from my Road Trip USA Animals post. Once we were done with all of our work related stuff, we sat down to learn a little bit about the history of our USA! Strawberry Shortcake read the first section of If You Were There When They Signed the Constitution to the other kiddos. That was it for the first state of Delaware, since we’re doing 2 states per week this year, we’ll be going through fairly fast! I’ll do my best to take pics and post our journey! If you’d like to come along with us on our Road Trip USA journey, click the image below to learn more! Erica, you never cease to amaze me! You are so wonderfully gifted with creativity 🙂 Thank you for sharing so openly with all of us who are a bit creatively challenged LOL. As a native Nutmegger, this made me grin. I hope you had a chance to learn about the Charter Oak. And as an interesting personal note, we had a family friend that I babysat for as a teen who owned Benedict Arnold’s grandmother’s house. We would find cool old artifacts (newspapers, toys, spoons, etc.) in the walls of the attic while exploring. We have been reading If You Were There When They signed the Constitution along with your curriculum. Just wanted to let you know about another resource. We have Netflix and found a great series called Liberty’s Kids it’s all about Americas History. They have a website too http://www.libertyskids.com/. My kids love it! I can’t wait til my kiddos are older so we can start your goegraphy programs! (We are 4, almost 3, and 20 months, and just enjoying some preschool right now) Your curricula are so thorough, yet uncomplicated, and flexible enough to expand/condense, etc! And I love how your kids are set up at the big table this year, too! Nice to have them all in one work space. Looks like a great set-up! 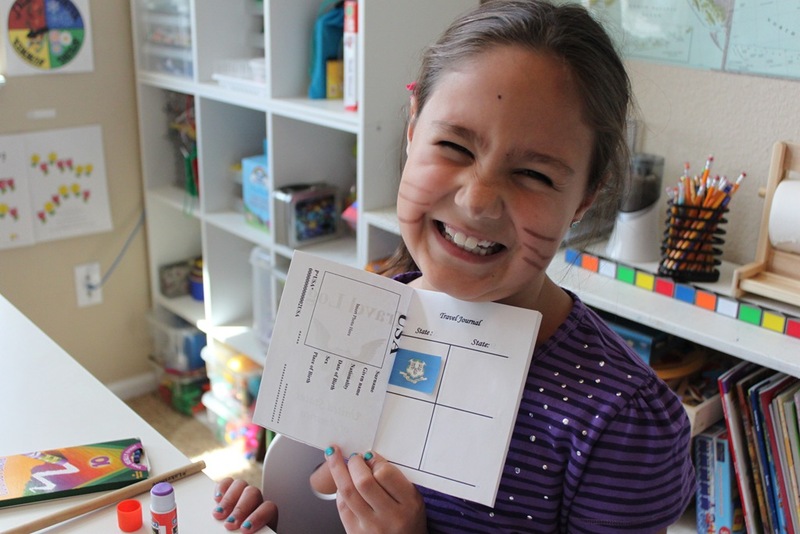 I’m always so impressed with the amount of detail you put into the curriculums you create. 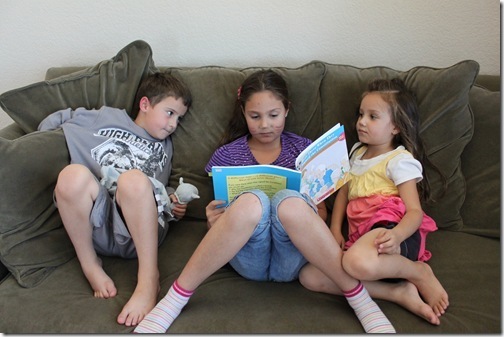 I’m so glad to be able to follow along as you do RoadTrip USA with your kiddos while I go through it with mine. It is in the back of the Teacher’s Manual in the appendix…see the table of contents (pg6) towards the end. I think around pg 198. My two youngest children and I will be working through your Road Trip this year, too. Can you please tell me….how are you planning to go through the whole program? Will you be doing this every day, twice a week, or what?? I’m trying to figure out how to get it all in and still cover each state thoroughly, too. I am doing a lesson Tues-Thurs. because our kids are participating in a co-op on Monday. It’s going a little fast, but I want to get through it in one year. What a great idea to do a road trip. I’ve never heard of Expedition Earth, so I’ll need to check that out. 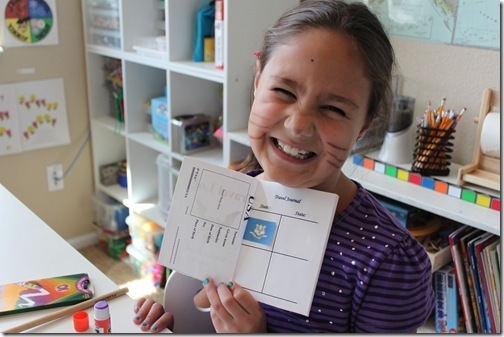 You have an awesome school room!